Yes, I know it’s Thursday, but this is the first chance I’ve had to write. This past weekend was Labor Day in the US, and boy did I labor! Laundry, carpet cleaning, dusting, shredding, taking out multiple bags of trash, tidying up–you name it, I probably did it. The closest I got to sewing anything was returning a pattern to Hancock Fabrics that I can’t use. It’s an elegant coat, but I can’t get something called loden cloth locally, and, well, since it would be about $32.50 a yard to order it from the UK, I don’t need it that bad. The coat calls for 4½ yards, and then there is shipping from the UK (Scotland, I think.) I just don’t need a new coat that bad; it’s not like I don’t have coats, I just like making one now and again. Burda patterns are designed and made in Germany for a European market, but they are easily available here. I like them, mostly, but this one was just not going to happen. Fortunately, I kept the receipt and only looked at the instructions–that’s how I realized that it was made just for loden fabric. Ok, back to the foodie thing. This week, my favorite newspaper, The Wall Street Journal, ran a story about how Greek yogurt is taking over--literally–and it’s getting on people’s nerves who like regular American-made yogurt. (Wonder how long it took them to come up with *that* clever headline. Get it? 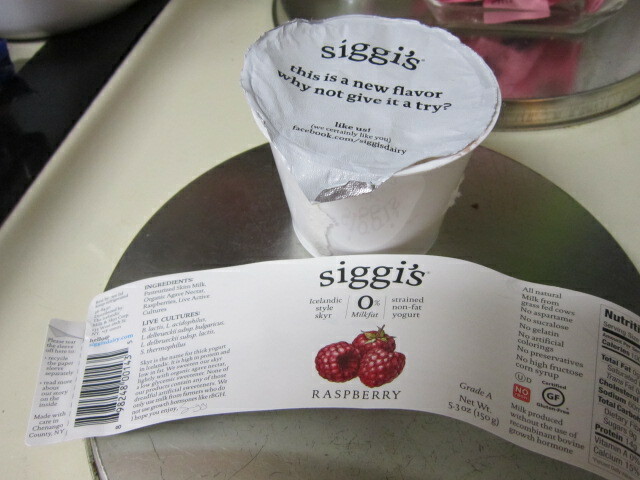 “Culture war?”) A couple of weeks ago I decided to try something new–Icelandic-style yogurt! YES! No kidding, you can read more about it here. If I remember correctly, it was $1.89 for that cup–not cheap, but definitely a treat. No strong yogurt taste like your regular stuff, and enough raspberry to make it pink. It has cane sugar, but not as much sugar as your usual yogurt–which usually has that poisonous high-fructose corn syrup anyway. So, how was your Sunday? What a day!! I started out at about 9:00 am and didn’t get home until, oh, heck, 4? Maybe 5? Oh, it didn’t END there–I dropped everything and went to get someone’s mail, then to Super Target in League City, then to the post office to mail his stuff and ship two IKEA catalogs to friends in New Orleans. THEN I realized I’d forgotten to look for fresh tarragon after Trader Joe’s didn’t have it, so I was also at Kroger getting me some. Are you understanding why I’m still tired on Thursday? Monday was all housework, all the time. But the cat appreciates the shampooed carpet. I guess. I was going to have lunch at IKEA but it was way too crowded, so I kept going. I went looking for the subject of my next blog post, which I’ll share more about when I write it. But in my search, I went first to Snap Kitchen, and ended up eating lunch–by this time, I was really hungry. Know what? I’m going to go back sometime. Healthy food, freshly prepared, plus some healthy (sort of) snacks, and takeaway in BPA-free packaging you can put right into the microwave. No, I probably wouldn’t, but you get the idea. Caprese salad was cool and delicious. 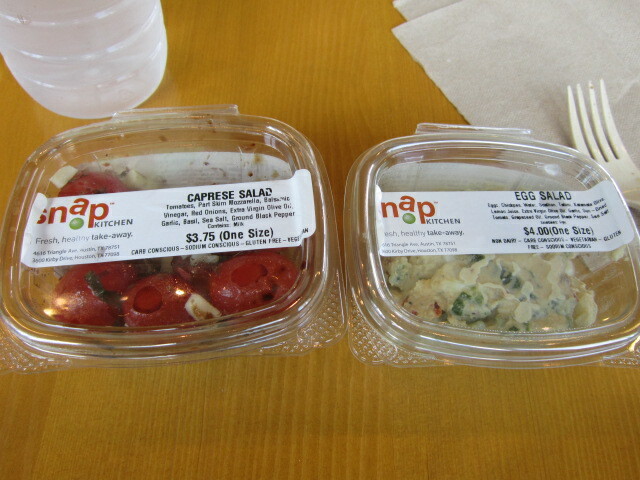 Egg salad isn’t something I would normally go for, but both of these are soy free, and the Caprese is dairy free, too. The egg salad also had chickpeas and hummus in it. Pretty good, and both these small sizes were just enough. Hit.The.Spot. Nailed it, in fact. And their menu is, according to the flier I took with me, 99% gluten free. You gotta like that. Snap Kitchen has several locations in Houston and Austin, and you can see their complete menu here. With dishes like Grassfed Bison Quinoa Hash and Almond-Crusted Goat Cheese Cakes, well, gluten-free doesn’t have to mean taste-free. I’ll be back–and I hope they put one down in my ‘hood one day. Next stop was Whole Earth Provision Company, an outdoor store which is right next to Trader Joe’s, but for some reason I failed to realize this. That’s OK–next was up the street to Sur la Table, where, yes, I purchased their coffee tamper for my aging cappuccino machine. Just to make sure it would fit, I brought the little grounds container from the machine and tried it out. Perfect, and the little machine seems to be working better since it’s got better pressure to make the espresso. Frothing is much improved, too. DUH. Maybe one of these days I’ll go find the instructions and finally READ them again. I got the bug for something sweet. No, they are not gluten-free. The white ones were originally believed to be coconut, but they were more like vanilla. 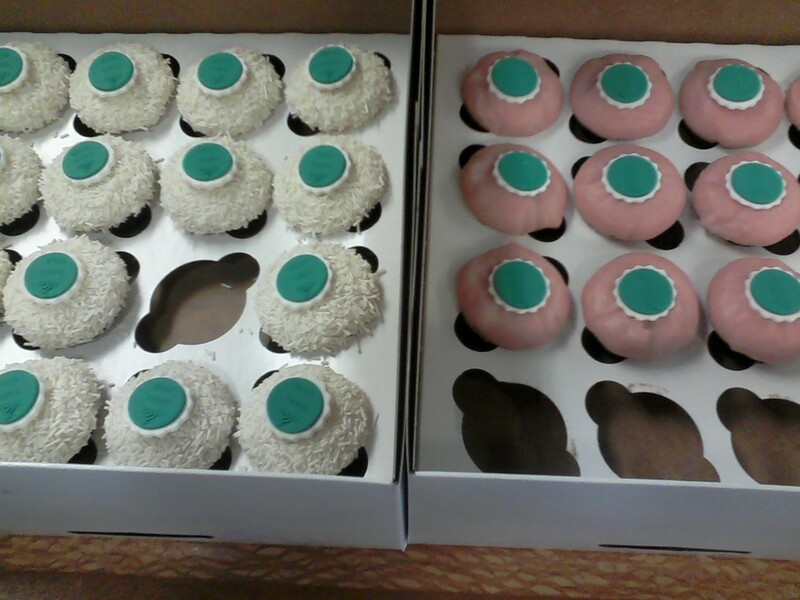 The pink were strawberry, with a drop of strawberry jam in the middle. Yes, they were worth it. Nevermind how many I ended up eating before they were gone. The white ones were the best.I am going back on the Draconian Diet Drops again soon, so I’m enjoying what I can now. You knew it was going to be chocolate, right? They make chocolate-on-chocolate, which is what you see here, as well as vanilla-on-chocolate. 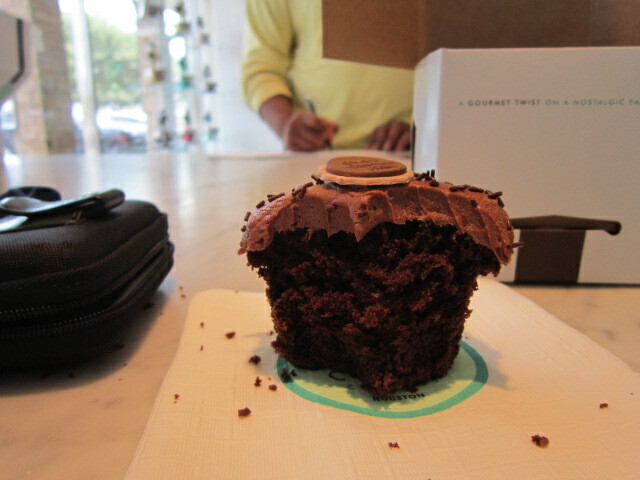 I figured if I was going off the rails, I’d do it right–gluten free chocolate on chocolate. Yum. . .that’s my camera case to the left of this delicious thing. 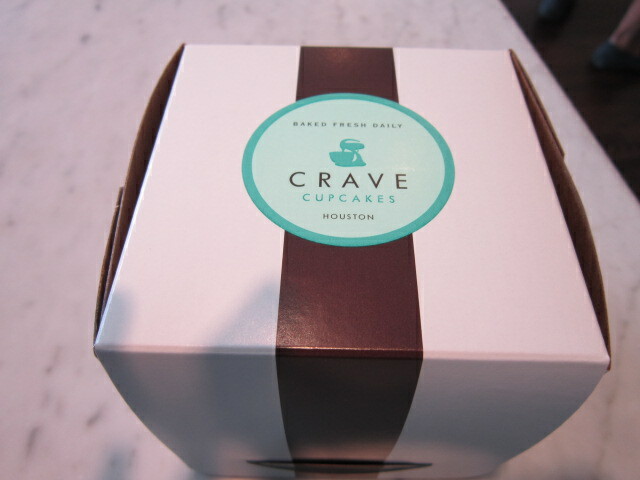 One thing Crave does–see that button on the top? It says “CRAVE GLUTEN FREE.” However, the ones brought to my office last week had a logo on it, and the name of the building, which was celebrating 30 years being built. (Houston is anything for a party, you hear?) Some just had the building shape in that button, some had the name of the building. 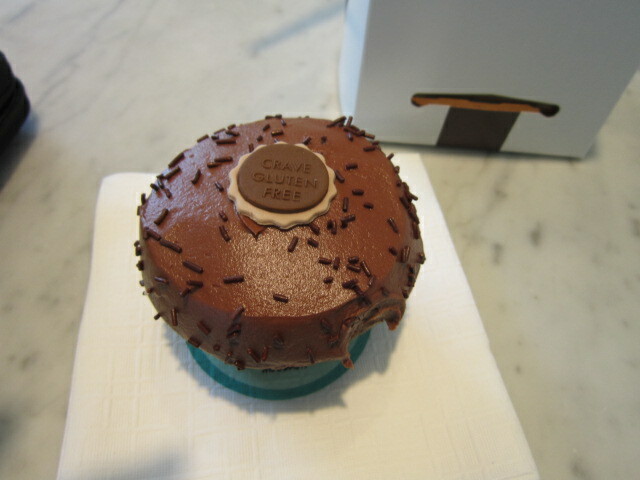 All of Crave’s cupcakes have that little button with a description on them. They also have a vegan model, although I think that “non-dairy frosting” has tofu in it; I’d have to check some other time. There are actually two Houston locations, and you can see their entire menu here. Much as I enjoyed this tasty cupcake–and I really did–I have to say I think the gluten free model I had at Frost Bake Shoppe in The Woodlands was better. I’m not sure why, and I may be comparing apples and oranges, but for some reason, I remember that one as softer, less sweet, and the icing much softer and butterier. Is “butterier” a word? Sure, it’s a technical term. Now, the last stop was the Trader Joe’s next door to Whole Earth, and I did that last because I was planning to buy cold stuff. You know, meat, veg, that sort of thing. Unfortunately, I forgot the small insulated bag I have from Target, and ended up buying one from Trader Joe’s for $6.99. In Buddhism, we call this a ‘benefit.” Because that new bag is bigger, better insulated, and no squishing of anything. They even gave me two frozen bottles of water to keep everything cold! I had a piece of London Broil I bought on sale, but didn’t know what to do with it. I looked in Ina Garten’s Barefoot Contessa Foolproof and found a recipe for Mustard Marinated FlankSteak on page 126. It’s what I needed fresh tarragon for, and got some shallots at Trader Joe’s too. You let the meat marinate in the fridge in this mustard/olive oil/shallot mixture overnight, and OMG–it is SOOO GOOD! I love having the best lunch around. 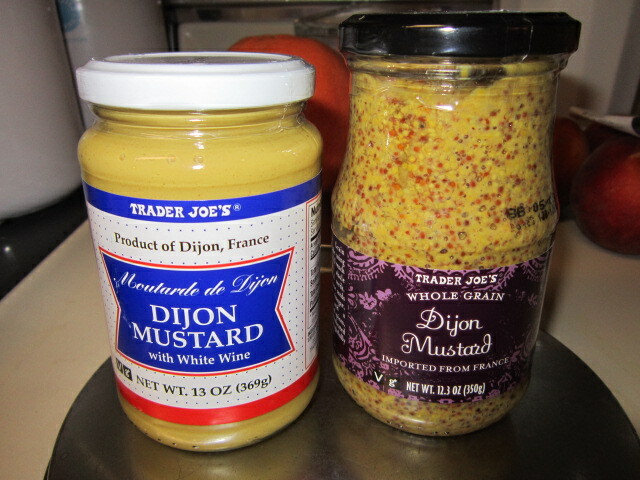 Trader Joe’s two types of Dijon mustard. Why get just one? One thing I did do and wish I hadn’t was get a carton of their TJ Coconut Milk. It looks just like the almond milk, and with that quick glance, you’d think you were getting almond milk, too. It’s not bad, and I’ll use it in my coffee and tea, but no more, I’ll stick with either almond milk or regular dairy. Incidentally, if you’re lucky enough to have a SuperTarget in your area like we have in the Houston metro area, Target has a new line of organic products called Simply Balanced. I’ve bought the organic skim milk for my smoothies (subject of yet another future blog post) and while I like it, the cat doesn’t. I guess because there’s no fat in it, but she’s a fussy cat anyway. Well, dear readers, it’s getting late and I will write again soon. Please take care, and eat good food anytime you can–unlike two of my travelers, who went to Midland, TX last week for a networking activity and had some of the worst food they could find! It was just one place, and not a slur on Midland. Just don’t make that mistake–eat good food, what ever it is.